Sound releases tension and disharmony on the physical body but also accesses the deeper emotional levels to unlock the stores of memory lodged in the muscles. The body is more than 70% water – even our bones and marrow are 25% water– and because sound travels more than four times faster in water, the body acts as a perfect resonator. Healing with sound is a natural mode of healing and dates back to the ancient civilizations of the Lemurians, Aztecs, Egyptians and the Chinese. It’s a form of vibrational, energetic and harmonic healing. Our bodies function best when there is harmony, resonance and balance. As our hearts beat and our lungs regulate breath, our organs work in mutual support and resonance with each other. ​Music and sound have a way of touching us deep within. The idea behind healing with sound is to provide your mind and body with frequencies that promote relaxation and health. Disease arises when there is imbalance, or disharmony, along the body’s energetic pathways. The treatment consists of the application of tuning forks to key acu-points. ​Sound therapy is based on the principles of harmonic resonance and influences the body and energy field by changing its frequency. It acts as a catalyst to healing and transformation by transferring energy frequencies into the physical body. 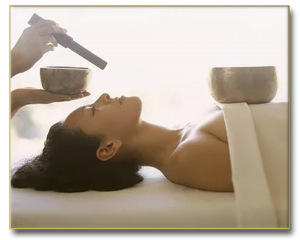 It is effective because it introduces relaxing and health-promoting frequencies to your mind and body. As your body resonates with a needed frequency, it reminds your body’s energy field of its original blueprint and helps restore harmony to the system. Your cells respond to these frequencies in a positive or negative way. ​The goal is to activate the body’s energies toward equilibrium and balance. This can be accomplished with the help of a vibrational remedy, light or sound frequencies, crystals, and hands on healing. 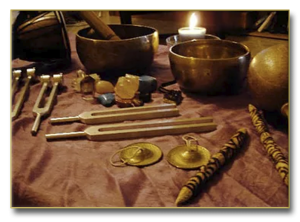 ​Tuning forks and singing bowls have long been used to encourage healing with sound. Both the quartz crystal singing bowls and metal Tibetan singing bowls are instruments of sound healing, meditation, ritual, prayer and trance induction. Depending on the size and composition of the bowls, they vibrate at specific frequencies and produce different tones. When using Tibetan singing bowls for healing, one sound may be introduced or multiple bowls will be played to provide needed frequencies. A bowl may be held near you or passed over your body. ​It is up to the healer to channel a higher energy frequency that will raise the vibration of the receiver. Negative states may shift immediately or the process may take time over multiple sessions. ​Sound releases tension and disharmony on the physical body but also accesses the deeper emotional levels to unlock the stores of memory lodged in the muscles. The body is more than 70% water – even our bones and marrow are 25% water– and because sound travels more than four times faster in water, the body acts a perfect resonator. After a session, it is not uncommon for the field to go back to its previous frequency, much like an individual returns to familiar postures after a body work session. Having a harmonic healing session once a week or more and/or taking a vibrational remedy several times a day reminds the energy field of the desired frequency. It usually takes a while for the field to stabilize and hold a higher frequency. ​Remedies work gently and safely while continuing to introduce a healing vibration. They introduce a vibration into your energy field whether used externally or internally. Some of these remedies are taken multiple times a day to keep reminding your system of the vibration you want to stabilize in your field. ​Ultimately, your energy field and your mind will accept the healing and resonate with the new vibration. When we are attuned to the delicate vibrations of the universe, we are better able to resonate with our core essence, or true self.